I have a special connection with millions of children and adults all over the world. 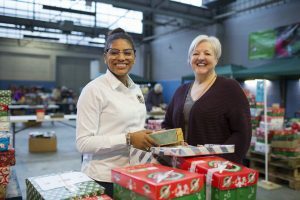 This connection is a shoebox; and here is my Operation Christmas Child shoebox story. Bluefields, the small city in Nicaragua where I was born and grew up, for a very long time was not treated as though it was part of the same country. This was because we were physically and culturally different from rest of Nicaragua. I grew up with my mum, dad, and two older half-brothers. The first eight years of my life both my parents had full-time jobs and were able to provide for the family. But unfortunately, that changed. My dad left us and my mum lost her job. This brought a lot of instability in our family. There were no job opportunities in Bluefields then, and there still aren’t many today, so my mum had to leave us to work abroad as a cleaner on a cruise ship. My brothers, sisters and I went to live with family. My family believed there was a God, but we didn’t have a relationship with him and we didn’t live a Christian life. My brothers and I went to church with friends and cousins, but it was mainly for special occasions like Easter, Christmas, New Years and Children’s Day. On one of these special occasions, my neighbour and Sunday school teacher encouraged me to attend church because ‘there was going to be a big surprise for the kids!’ On this particular Sunday, Sunday school was a bit fuller than usual, the children’s clothes were cleaner than usual, and we were all on our best behaviour. We knew that we were going to receive something at the end and didn’t want to jeopardise that! When Sunday school finally ended, the teachers asked us to form two lines, one for boys and one for girls. We were beyond excited. The shoeboxes were covered by a cloth and when the teachers pulled the cloth away they uncovered lots of brightly coloured shoeboxes. There was a loud deafening cheer of excitement. The gifts looked so good. As the kids in front of the line were getting their boxes, the ones in the back were pushing to get to the front. Very quickly, all of the shoeboxes had an owner and we were all exploring, playing and trading the toys. I remember the moment I opened my shoebox. It had a foreign smell, and I forever associate it with the smell of America. Of course today I know it was the sweet smell of the soap but for a little girl who always dreamed of travelling to America this was special. Even today when I think of that smell and that moment, it still makes me smile. I received many gifts inside my shoebox. Among them were fruity markers that had hearts, spirals, flowers and fruit stamps. I tried them out on my friends’ arms and faces and all my bedroom walls were covered with stamps. I could not believe that a group of strangers were willing to choose out toys and send them to another country to children they did not know, – children like me! I think this was the first act of love and generosity I ever recognised. I remember walking back home and seeing loads of kids with shoeboxes under their arms, smiling from ear to ear. We were all so happy. This had a great impact on me and my friends, it was the best day of church I can think of and I still talk about it with my friends. 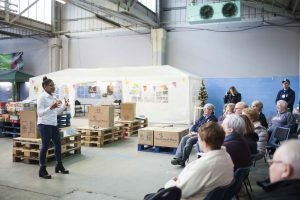 At the time I did not realise it but through the shoebox a seed had been planted in my heart and I didn’t know it, but people I never meet were praying for me that I would come to know Jesus. Years later my dream of travelling to America came true when I received the opportunity of a scholarship in college in America. There I became friends with a group who were Christians, but they were unlike any Christians I had ever meet. They were fun and joyful, completely different to my impression of Christians. They told it was not enough to know of Jesus in your mind but you had to know him in your heart and have a relationship with Him. They demonstrated love and care for me and through them sharing about Jesus to me, I decided to give my life to Jesus. I now knew it was important to go to church every Sunday and not just special occasions like I did back in Nicaragua. So I found a church and attended every week. One Sunday morning in winter the church showed a video of Operation Christmas Child, like the ones available on this website. The congregation was encouraged to take a box home and fill it with gifts for needy children around the world. I recognised the box and the logo, and I recognised the joy of the kids on the screen. I then realised that I was sitting among ‘the strangers’ that sent gifts to kids in other countries, kids like me. I was told that many people across the world had donated shoeboxes and were praying for every child that received a shoebox. They had prayed that children would come to know Jesus as their Saviour. Just like what had happened me. The shoebox I received could have been from someone sitting next to me. I don’t know who sent my shoebox and demonstrated Gods love to me through it, but their gift and prayers changed my life. It was one step on my journey to realising that Jesus would be my Saviour and King. Thank you for packing shoeboxes and changing lives!